Donald, a frequent traveler between New Zealand and China, to think about how to deal with his pet bunny Jaz, when he decided to move back to China with his Chinese girlfriend. Moving house is something that most people go through, for an expat, it is just a way of life. Packing up your entire house and ensuring it can be squeezed into 30kg of check-in and 7kg of hand luggage can be a painful and emotional process. However, it becomes even more difficult to organize when a small pet is involved. I am currently beginning the process of packing up my life again and heading back to China. Recently, my girlfriend and I packed all of our belongings into our small car, including our pet rabbit, her cage and bag of hay and left our apartment to travel to my hometown where my parents live, to drop off most of our things before heading overseas. Our little bunny Jaz was not impressed with being bundled into the car and then stuck for four hours in the bowels of a ferry, before being driven a further two hours to our temporary destination. Since arriving, we have unloaded most of our belongings and we are commencing the process of again condensing our lives into one suitcase and a bag. We have spent many sleepless nights wondering what to do with Jaz. She is two-and-a-half years old and is expected to live a further four to six years. My parents are fervently against the idea of taking on a pet as they are enjoying the freedom of their retirement without dependants, human or rabbit-based! None of our friends are settled enough to want a rabbit and we ourselves aren't fully happy with the idea of leaving her behind. We have started looking at how to take her to China with us but are not sure if it is possible. There are many considerations of course, how will she like China? The hot climate? Will it be too dry/wet? My girlfriend's parents aren't overly thrilled about the prospect of a rabbit-granddaughter either. Although her dad did crack a smile when I called him "Rabbit Grampa" when he met Jaz last summer. It also places restrictions on us in terms of how often we can change countries. If we decide to take her with us, we wouldn't want to bring her back to my home country again in the future, so in a way we have to commit to living in China for a few years. It is ironic as my girlfriend bought the rabbit so it would keep her in New Zealand rather than wanting to move back to China all the time! It makes me wonder how difficult it is for other pets, such as dogs or cats to get their ticket to other countries. I wonder how common it is for other expats to bring their pets with them or if the pets are left behind, what they would do with them. There is also the other side of the coin, do other expats get pets while in China and then try to keep them? Pets are a big commitment and the decision to get one needs to be taken very seriously. When I was living in China in the past, I had to refuse a gift of two adorable hamster-type creatures who tried their best to steal my heart with their furious digging and snuffling around in a little bucket of hay. I grew up in quite a rural place as a child. We had a dozen sheep, a cat and three rabbits ourselves and our neighbors had horses, pigs and chickens. 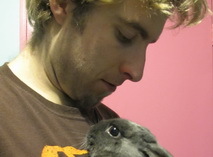 The animals growing up and dying was just a part of life but it doesn't make leaving my current rabbit any easier. One of my friends cheekily suggested putting a few toys in the suitcase and then putting the rabbit in with them, so she would look like a stuffed animal. I quickly pointed out that most toys don't have a skeleton when scanned by an X-ray through customs. There is also the fact that I don't want to go to jail just to keep her! Surely there is a simpler, more legal way to take wee Jaz with us. Maybe we can buy another ticket and strap her in a seat next to us in the flight, after all, airline companies are developing comforts such as the sky-couch to accommodate customers. It reminds me of when I was a kid and traveling overseas with my family. We had been at an aquarium and I had bought a toy otter which was covered in fake fur. It was about the size of a mouse and if I held it partially concealed in my hand and moved it a bit it looked extremely real. As we boarded the plane I could hear the disapproving remarks form several travelers around me and I sneakily cradled it in my hands and make subtle squeaking sounds. For now the search for a rabbit-visa or a loving home continues, one way or another I can't wait to be back in China soon. The story above was written some months ago. Now we have been back in China for a while and are settled in again. In the end we left Jaz with a family friend as a temporary measure while we continued to look for ways to bring her to China. In the end however we had to realize that her future lay in New Zealand, not with us. As sad as it was, we steeled our nerves and wrote an email to my friend asking him to help us find her a permanent home. Last week (the week before Christmas in fact) we received a reply informing us that while we were here in China, having our first Christmas in three years without Jaz, he was being secretly gifted to a young girl as a Christmas present. There were a few tears and moments of sorrow but it seems to be a nice way for us to know that she will find a happy home and that she has become a present!